Getting fit and staying fit can be a challenge for your willpower. But getting fit and staying fit on a budget takes imagination as well as willpower. As I talked about in a previous post, health and fitness has suddenly jumped to the top of my priority list. Finding ways of getting fit and staying that way without spending a fortune (or if I can help it – anything) is, not surprisingly, my frugal fitness challenge. If you’re also looking for ways to workout that don’t cost a fortune you might enjoy this list of frugal fitness ideas, too. One of the hardest things to do when you first decide to get fit is go out and exercise in public. If this is you, don’t waste your time and money joining a gym until you’ve built up your confidence, as well has your strength and stamina. Skip the gym membership and work out at home. If you’re looking for accountability try using social media. Document your progress on Instagram or Facebook and let the world see how you’re progressing. You still don’t have to leave home but you can still get accountability or encouragement if you need it. Instead of joining a gym, invest in some basic equipment. Start with a pair of handheld weights (start light and work your way up), a skipping rope (jump rope) and an exercise ball. These three items will cost you a lot less than a month’s gym membership plus, you’ll have them forever. If buying new is out of the budget consider buying second hand equipment from thrift stores, yard sales, ebay or craigslist. Of course, you can always keep on the look out for major sales at your local sports store, too. Note: If you’re buying online make sure you pay careful attention to the shipping costs. Heavy and/or bulky items can cost a lot to post. If money is really tight, consider making your own fitness equipment from stuff you already own. For example, soup cans can become hand weights and an old pair of tights can become improvised resistance bands. Remember the trick is to be creative. There are so many different styles of fitness videos available you’ll never be able to use the boredom excuse for not working out. From Abs of Steel to Zumba , there’s bound to be an exercise video that sparks your enthusiasm. You can either buy a video (DVD) if you love it or you can borrow it from your local library, plus you watch fitness videos on Netflix or on YouTube. In fact, there are so many fitness gurus on YouTube you’re bound to find one, or ten that you love. And, they’re free! Think about the sports you loved to play as a child; is there a casual, just for fun league you can join? Perhaps your workplace has a team you can join? Sometimes working out seems like too much work whereas a game of basketball is just plain fun. I know which I’d prefer to do! Joining a sports team is also a great way of being social and developing new friendships. Even if your team never wins a game, you still can’t lose. Walking is definitely my favourite activity. It’s easy on the joints, anyone can do it and you don’t need any special shoes or clothing. Walking is one of the easiest ways to be active because you can do it anywhere and you can use it as a form of transport, too! When you can, leave the car at home and walk. You can go for a walk around your neighborhood or take a drive to a local or national park and spend the day hiking the trails and enjoying nature. Note: If you’re going to hike – be prepared. Wear appropriate shoes and clothing and make sure you have plenty of water and snacks with you, too. Cycling, either stationary or on the road, is a great form of exercise. Plus, like walking, it can double as a mode of transport. 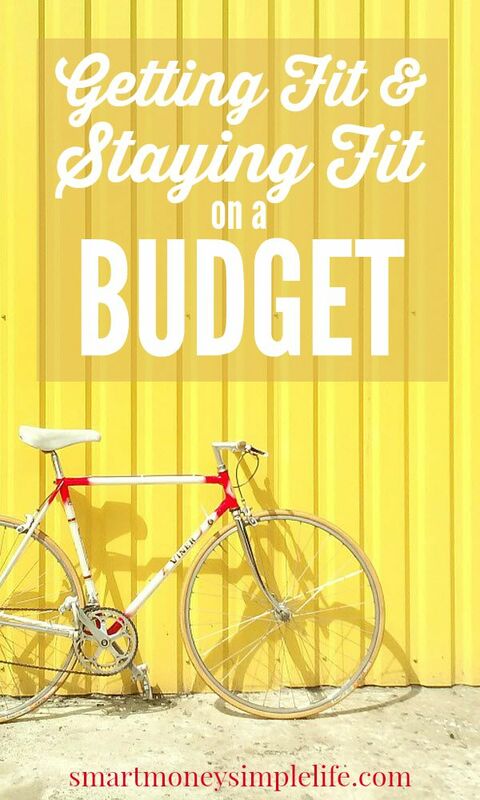 So, not only is it the perfect budget conscious exercise it can save you money, too. If you’re cycling on the road just be sure you’re up to date with all the road rules pertaining to cyclists. Besides walking, running could be the cheapest sport available. All you need is a pair of quality running shoes and some comfy clothes and you’re ready to start pounding the pavement. Rome wasn’t built in a day and runners aren’t either. Start slowly and build your aerobic fitness over time. There are apps available to help or you can start by briskly walking, then add in spurts of jogging. Over time you will naturally increase the amount of time you can spend jogging until you’re jogging all the time. If you really want to fire up your motivation, sign up for a 5k! There’s usually an entry fee but it usually goes to a good cause and you’ll probably get a t-shirt, too. Running Hint: Splurge on quality running shoes. Running (and other high impact activities) put a lot of stress on your joints so make sure you’re wearing the right shoes for the job. Do some research so you know the style of shoe that suits your foot (pronation, supination) and start stalking the sales. I enjoy the solitary nature of my morning walk. Mostly because it’s a chance to clear my head of all the noise of living a busy life. Some people would rather do just about anything than workout alone though. So, for those extroverted souls, the best solution is a workout buddy. If you have a friend or family member who’ll commit to getting fit with you, go for it. This can backfire though if they’re not as committed to the process as you are… So choose carefully. Another bonus of having a workout buddy is the potential to share a personal trainer. Trainers will often give discounts for group sessions so if you’re considering a trainer to get you started, this is one way to make it more affordable. A personal trainer is not a budget option but it might be a good investment to get you started. Want to track your fitness goals? There’s an app for that. There are plenty of fitness apps if you have a smartphone. I don’t run, but one of my workmates used Couch To 5k. It really helped her start running and importantly, keep running until she’d reached her goal of running continuously for 5kms. That was over three years ago and she still loves to run. There’s also a 10k version if 5k is too easy for you. Lose It – tracks your diet and calories burned. If you’re interested in trying out different classes, see if you can find discount coupons that match what you want to do. Caveat: Check out the company before committing and never, ever make a purchase just because it is a great deal. You don’t even need to own the dog! Consider this one way of combining your frugal fitness with a good deed. Do you have an elderly, infirm or even just seriously busy neighbour who’s dog is stuck in the yard all day? Offer to take Fido or Fifi for a walk each day. Everyone wins! Another option is offering to exercise the dogs at a local animal shelter. A happy dog is a dog that gets a good walk or run every day. It can’t hurt to ask. Sometimes you get what you pay for, sometimes you don’t. You can be pretty much guaranteed that if your workout clothes are from a fashionable activity brand name as apposed to a sports brand, their quality wont match their price. If you want brand name items, wait for the end of season sales at the sports stores. For the most part, the sports gear you buy from stores like Target will do the job of the higher priced clothing but at a fraction of the price. If, after all those frugal fitness options you still want to get a gym membership, wait for a deal or buy it in January. In January, gyms everywhere are trying to cash in on all those fitness related New Year’s resolutions. Be prepared and do your research well in advance. Check out all the gyms you’re interested in. See if they offer a couple of free passes so you can check out the facilities first hand. Also, ask if they have a mailing list you can join. Once you’ve picked the gym you prefer, it’s then a waiting game for the deal that best fits your budget. Seek your doctor’s advice before beginning any fitness program. Plus, the smart thing is to start slowly and track your progress. If you’re not feeling the burn you might need to work a little harder but… never continue exercising if you’re in pain. The state of our health is the one thing we invest in every single day of our lives, whether we mean to or not. If you eat nutritious food, get some physical activity and have a good laugh every day, you’re making a solid investment in your future well being. If you’re not, well, you could be undermining all the other smart choices you’re making for yourself and your family. This list is by no means exhaustive but ought to be enough to get you thinking of ways to workout without trashing your budget or spending money where you get the least value. Getting fit and staying fit can be done on a budget! I hear you, Sam! Just think how bad it would be without the tennis? Solid list, Diane! I did exactly what you wrote: started at home, signed up for a gym when I was more confident. I quit a year after, to save money and I now workout at home at least 4x a week. But walking/hiking is my favourite activity to do on weekends. 🙂 speaking of, happy Friday! Have a good one. We’re hooked on exercise videos right now. It’s cheap and easy to do at home! I have a couple of them, too. The zumba one kills me every time but it’s a lot of fun. This is exactly why I run! It’s cheap. 🙂 One day, I hope I can do yoga and take classes, but until my law school loans are repaid, I do whatever I can the cheap way. I hear you! Law school is expensive enough here in Aus (my daughter is looking at studying for a JD), I can’t begin to imagine how much it would be in the US. Good luck! It’s a great habit to get into, that’s for sure. These tips are so practical and helpful. As a busy woman, I tend to make far too many excuses. You’ve pulled some of my “frugal” excuses away. There is no excuse not to stay healthy because you really can do it in a cost-effective way. Thanks for the reminders!